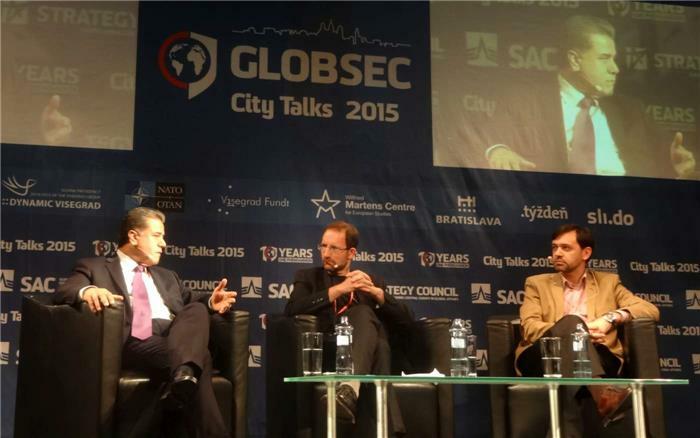 For the second time, Head of the Department of Foreign Relations, Minister Falah Mustafa represented the Kurdistan Regional Government at the global security forum 2015 (GLOBSEC) in Slovakia’s capital city, Bratislava. During his three-day visit, the Minister spoke on a number of panels and held a number of bilateral meetings with leaders from Eastern Europe, as well as high-ranking officials and Senators from the United States. On The sidelines of GLOBSEC 2015, Head of the DFR Minister Falah Mustafa met with Romanian Foreign Minister Bogdan Aurescu. Minister Mustafa informed Minister Aurescu on the latest military and humanitarian developments in the Kurdistan Region. He reiterated that Kurdistan is in greater need of support from the international community. Minister Aurescu showed gratefulness to the KRG and the Peshmerga forces for their efforts to combating ISIS and made clear that together with their European partners, efforts will be made to come up with further strategies on how to address this issue. Minister Aurescu also stressed on the essential necessity for national reconciliation in Iraq. In regards to bilateral relations, both sides agreed that there is room to further enhance their ties in all fields. On the margins of GLOBSEC 2015, Minster Mustafa also met with Bulgarian Minister of Foreign Affairs Daniel Mitov where they discussed strengthening bilateral relations between the government and people of both nations. Both sides agreed that an upgrade of the Bulgarian diplomatic mission is necessary in the process of further deepening bilateral relations. Minister Mustafa briefed Minister Mitov on the situation in Iraq and the role that the Kurds are playing since the emergence of ISIS. He also explained the overstretched capacity of the KRG in dealing with the estimated 1.8 million Refugees and IDP’s that have found refuge in Kurdistan and urged for the continuous support of KRG’s international partners. During his meeting with Hungarian Minister of Foreign Affairs and Trade, Peter Szijjarto, Minister Falah Mustafa talked about the recent security developments in Kurdistan and the continuous challenges posed by ISIS to the region and the world at large. In regards to the Peshmerga forces, Foreign Minister Szijjarto showed Hungary’s willingness to treat a number of wounded Peshmerga in Hungary. In addition to this, Minister Szijjarto confirmed that a number of Hungarian commanders are to be deployed in the next couple of weeks as part of the international coalition defeating ISIS. Hungary has arranged scholarship programs for Kurdish students at various universities throughout Hungary. To further consolidating KRG-Hungary relations, Minister Szijjarto encouraged a KRG representation in Budapest and showed an interest for cooperation in all fields. In his meeting with Slovakian Deputy Prime Minister and Minister of Foreign Affairs, Miroslav Lajcak, Minister Falah Mustafa thanked him for the platform provided to the KRG at this year’s Global Security Forum, for bringing in a Kurdish voice in light of the vast changes dominating the Middle East today. Minister Mustafa then continued to update the Minister on the security, political, and humanitarian situation in Iraq and Kurdistan. In regards to Kurdistan Region’s nascent democracy, Minister Lajcak showed his governments readiness to share their experience as an independent and democratic country since the Velvet Revolution in 1989, resulting in the dissolution of Czechoslovakia into two separate entities. Minister Mustafa concluded the meeting by extending an invitation to Minister Lajcak to visit Kurdistan, and stressed on the importance of visit exchanges between the two governments. On the Sidelines of GLOBSEC 2015, Minister Mustafa met with Miroslav Dusek, Senior Director, Head of the Middle East and North Africa at the World Economic Forum (WEF). Both sides discussed ways and means to foster relations between KRG and the WEF and agreed that further engagement of the private sector would help met the economic challenges as a result of the security and humanitarian challenges that the region is facing. Minister Mustafa also met with General John Allen, the Special Presidential Envoy for the Global Coalition to Counter ISIS. He highlighted the political and security situation in Kurdistan and the wider region and called upon KRG’s international partners for their continued support to the Peshmerga forces in their fight against ISIS. During his GLOBSEC sideline meeting with Ambassador Jan Kubis, the United Nations Special Representative to Iraq, Minister Mustafa emphasized the Humanitarian challenges in Kurdistan. Minister Mustafa reiterated KRG’s commitment to its open door policy and the maintenance of Kurdistan as a safe haven in light of the deteriorating security situation in the rest of Iraq. Minister Mustafa concludes his visit to Bratislava with a sideline meeting with U.S. Senators John McCain, John Barrasso, and Tom Cotton where he updated them on the recent developments on the political and security front in Iraq and Kurdistan. Minister Mustafa thanked the Senators on their continuous support to the Peshmerga forces in their fight against ISIS. On the last day of the Global Security Forum 2015, the KRG was given a further podium to communicate the KRG message, where Minister Mustafa held a press conference and briefed the media agencies on the developments and challenges in the Kurdistan Region.